Air Display is a great iOS app that turns an iPad into an external display for just about any Mac or Windows PC. It’s been around a while, but now there’s a new free version available that lets you try out a full featured ad-supported version before buying the regular version, offering an excellent way to see if AirDisplay fits into your workflow. Though the screen size makes it best for iPad, Air Display Free technically works with iPhones and the iPod touch too, and there’s no shortage of helpful ways to use it on whatever device you run it on. Install the menubar utility on the computer and launch the app and you’ll find some quick easy instructions on setting it up. You’ll be up and running in no time and able to enjoy the extended desktop that Air Display provides. The free versions ads aren’t terribly intrusive which makes it more than adequate for trying the app out and for occasional use, though if you’re happy with it you’ll probably want to shell out for the full version to get rid of the ads. Performance varies a bit based on the computer in use and the iPad model. Retina iPads have the benefit of being able to function as an external HiDPI display for the Mac, but some older Mac models may struggle with HIDPI video output leading to CPU spikes and undesirable performance. For older computers, it’s probably best to run in lower resolution mode on retina iPads, but that’s a nonissue for iPad 2 and iPad Mini, and most any modern Mac or PC should be able to push the higher resolutions without incident. All in all, Air Display is a great app, and with the new free version there’s little reason to not try it out on you iPad, iPhone, or iPod. What’s the Maximum Resolution a MacBook Supports for External Displays? I absolutely love this app, works great on my iPad 2 and it holds my iTunes and Twitter windows. 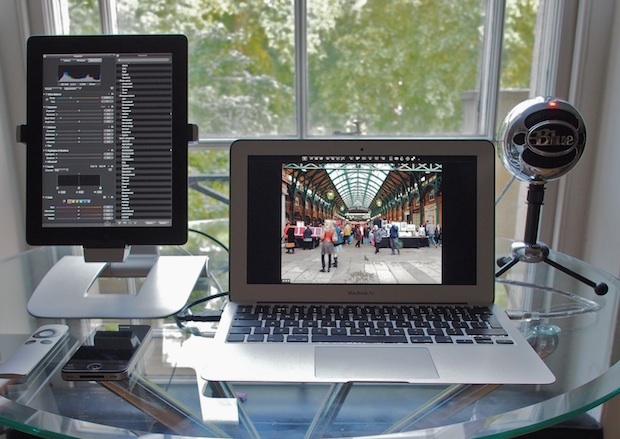 For MacBook owners there is just no better way to work on the go with dual displays. What the name of the iPad stand in the picture? Can anyone tell me what the stand here is for the IPad 3. It appears to be aluminum. “…….All in all, Air Display is a great app, and with the new free version there’s little reason to not try it out on you iPad, ……..iPHONE……., or iPod.”. Nice Hair Dryer next to the MacBook Air. That is the finest Ipad stand I have seen yet. No leads on where this one came from? Looks like it is a charging stand also. Here is the link to the stand…. Great idea for an external monitor. Most times, I get tired of gripping my iPad in my hand and would want to take a break by using it as an external display, as well as a screen that I can use to watch movies without having to worry about the screen angle. I’m bookmarking you. Do they still offer the free version? Can’t seem to find it in the App Store and the link above doesn’t bring it up from my iPad. Am I missing something? Please add note to article – they do NOT offer the free version anymore, and they do not even offer a trial version so you can see how well it works on your hardware.